The best way to ensure that you and your family are not exposed to carbon monoxide is to eliminate this poisonous gas at the source. Make the maintenance of your fuel-burning appliances, equipment and venting systems an absolute priority. Have a trained, certified technician check your furnace, gas, stove, fireplace or fuel-burning appliances on a yearly basis. Install a tested and CSA-approved alarm on each level of your home, cottage or boat cabin. These will warn you of rising levels of CO, giving you and your family time to escape. Without CO alarms, the only way to know if CO is present is when the physical symptoms of CO poisoning become apparent. ...By then, it might be too late to avoid injury. Here are some Do’s and Don’ts when it comes to CO safety. Do: Have your home/cottage heating system, fireplace and flue inspected and cleaned by a qualified technician every year. Do: Keep chimneys clear of bird and squirrel nests, leaves, and other debris to ensure proper ventilation. Do: Ensure your furnace and other appliances, such as gas ovens, ranges, and cook tops, are inspected for adequate ventilation. Do: Have your gas fireplaces inspected each fall to ensure the pilot light burns safely. Do: Always make sure your fuel-burning appliances have an adequate air supply to prevent a CO hazard. Don't: Use portable fuel-fired appliances (i.e., portable barbeque, heater, stove) inside your house or garage. Don't: Operate gasoline-powered engines in confined areas such as garages, basements or boat houses. Don't: Do not leave your car, mower, ATV or other vehicle running in an attached garage, even with the door open. Don't: Block or seal shut exhaust flues or ducts for appliances such as water heaters, ranges, and clothes dryers. 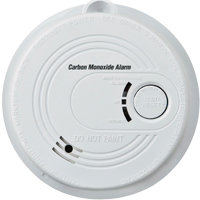 Most people think the best way to protect against carbon monoxide poisoning is to have a CO alarm in your home. While that's important, the first line of defense against CO poisoning is prevention through annual inspections of your home heating equipment, including vents and chimneys. Alarms are a good second line of defense and every home should have at least one for each floor. Unlike smoke, which rises to the ceiling, CO mixes with air. If a combination smoke/carbon monoxide detector is used, it should be located on the ceiling to ensure it will detect smoke effectively. A CO alarm works much like a home smoke alarm and beeps loudly when the sensors detect carbon monoxide. When choosing a CO alarm, look for the CSA Blue Flame mark and the reference “CSA 6.19-01” – the most up-to-date Canadian standard. This shows that the alarm met recognized standards for safety. CO alarms should be installed as per manufacturer’s instructions. Follow the same manufacturer’s maintenance procedures as you would with smoke alarms. Remember to test your CO alarm and smoke alarm once a month by pushing the test button on the unit. Replace batteries once a year, including back-up batteries for plug-in alarms. A good habit is to change the batteries every fall or spring when you change your clocks. Like most things, CO alarms wear out over time. Check the manufacturer’s instructions to find out when your particular unit should be replaced (usually after 7-10 years for CO alarms and 10 years for smoke alarms). Test once a month. Change batteries annually. Replace when required. Because carbon monoxide has no smell or taste, it's difficult to know if it's present in a room. But it has warning signs by how it affects humans – the symptoms are similar to the flu, without the fever. If the symptoms appear, it is imperative to get everyone, including pets, away from the source of the CO and to fresh air immediately and call 911 or the local fire department. When carbon monoxide is inhaled, it inhibits the ability of your blood to absorb oxygen and distribute it to vital organs like the heart and brain. This lack of oxygen can cause critical organ damage, and if severe, result in death. The symptoms for low exposure to carbon monoxide include shortness of breath, mild headaches and nausea. Higher exposure produces symptoms similar to the flu: nausea, headache, burning eyes, confusion, and drowsiness. Eventually CO poisoning can lead to unconsciousness and even death. The key difference is no fever with CO poisoning. The symptoms tend to disappear when a person gets fresh air. Infants and children absorb carbon monoxide faster than adults due to their high metabolic rates, so the signs will show up more quickly in children. For mild or moderate CO poisoning symptoms, (headache, dizziness, sore throat, drowsiness) get immediately outside for fresh air. (If you have pets, get them outside too). For more severe symptoms, the treatment for CO poisoning is 100 per cent oxygen, usually administered using a facemask attached to an oxygen reserve bag. People with extreme CO poisoning may have to be placed in a hyperbaric pressure chamber to receive even higher doses of oxygen. It’s important to find the source of the carbon monoxide. Your local fire department or public service company will help find the CO source and make sure the building is safe. They are similar to the flu – nausea, headache, burning eyes, confusion and drowsiness – except there is no fever. You and your fuel safety professional are critical to reducing CO risks in your home and cottage. If your appliances aren't in good working order, or if they're used in closed or confined spaces, then carbon monoxide can build up to dangerous levels. Have your fuel-burning appliances inspected by a certified professional. For furnaces, you can and should change filters and check for blocked furnace vents. However, the only person qualified to inspect your natural gas, propane or oil furnace is a certified heating technician. All certified heating technicians are registered with TSSA, so if you're not sure whether your technician is registered, call TSSA at 1-877-682-8772 for confirmation or click here to locate a certified technician in your area.